Fortunately for all of us, we’re better at our day job than singing Christmas carols, but that got us thinking about how you can stay safe this holiday season. Since holidays don’t change work safety procedures, you know what to do at work (unless you’re Santa in his workshop, maybe), but what about at home? We’ve rounded up a checklist of the top 10 basic precautions you can take at home to help keep you on the “nice” list when it comes to ensuring your whole family remains safe and injury-free throughout the season. Best of all – it’s downloadable, giving you the option to print and hang next to your stockings with care. To Prepare You for 2018! December 12, 2017 / Comments Off on To Prepare You for 2018! This year is coming to a close, and we want you to give you a head start as we head into 2018. In the spirit of the holiday season, we’re giving the gift of knowledge in the form of a safety calendar. And – it’s downloadable. On it you’ll find freshly added dates and events for 2018 to help ensure you’re in “The Know” of all EH&S events happening in the country and around your area. A few dates in there are still in a marked “TBD”, so remember to check back in a few months as these dates become more solidified. As an added bonus, we’ve added the shows we will be attending next year! So go ahead – download, print, post, and get planning on your safety dates for 2018! Stay Informed, Faster – We’ve Updated Our Catalog! October 9, 2017 / Comments Off on Stay Informed, Faster – We’ve Updated Our Catalog! Why are you good at your job? Because you stay in “The Know”. You know what’s going on in your company, and if you don’t, you figure it out. And that is exactly how we want to help you stay successful – by keeping you in The Know with Evolved Safety. We’ve had so many additions and changes in this past year that we had to update our catalog before next year’s edition! With new vendors and training materials hitting us left and right, you’ll want to take a look. New training titles from SafetySkills, UL, and more! New vendors include SHE Health & Safety Software, Digital 2000, Advantage Alert Driving, and more! The difference between temporary and permanent employees is easy enough to understand, but when it comes safety in the workplace, they should be trained the same. From a hospital hiring a nursing intern to a staffing agency hiring a temporary machine operator for another company, workers must be protected from hazards in the workplace regardless of the industry or type of employee. 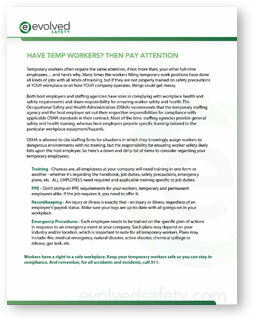 Temporary workers often require the same attention, if not more than, your other full-time employees… and here’s why. Temporary workers get placed in a variety of jobs, including the most hazardous jobs. Temporary workers are more vulnerable to workplace safety and health hazards and retaliation than workers in traditional employment relationships. Temporary workers are often not given adequate safety and health training or explanations of their duties by either the temporary staffing agency or the host employer. Regarding the training of temporary employees, OSHA says that to ensure a clear understanding of each employer’s role in protecting employees, the temporary staffing agency and the host employer must set out their respective responsibilities for compliance with applicable OSHA standards in their contract. Including such terms in a contract will ensure that each employer complies with all relevant regulatory requirements, thereby avoiding confusion as to the employer’s obligations. In other words, if you are using a staffing firm for your temporary workforce, that staffing firm should create safety awareness among employees and provide general safety training. Depending on the job task or work atmosphere where more specific safety training is needed, the staffing firm and host employer should communicate what training will be provided and by whom. OSHA is allowed to cite staffing firms for situations in which they knowingly assign workers to dangerous environments with no training, but the responsibility for ensuring worker safety likely falls upon the host employer – so we hope you’ve been paying attention. As an extra reminder boost, we thought it would be a good idea to come up with a list of items that you as an employer need to consider regarding your temporary employees. This list is available for download as well, in case you want to print it out and hang by your desk. Training – Chances are, all employees at your company will need training in one form or another – whether it’s regarding the handbook, job duties, safety precautions, emergency plans, etc. ALL EMPLOYEES need required and applicable training specific to job duties. PPE – Don’t skimp on PPE requirements for your workers, temporary and permanent employees alike. If the job requires it, you need to offer it. Recordkeeping – An injury or illness is exactly that – an injury or illness, regardless of an employee’s’ payroll status. Make sure your logs are up-to-date with all goings-on in your workplace. Emergency Procedures – Each employee needs to be trained on the specific plan of actions in response to an emergency event at your company. 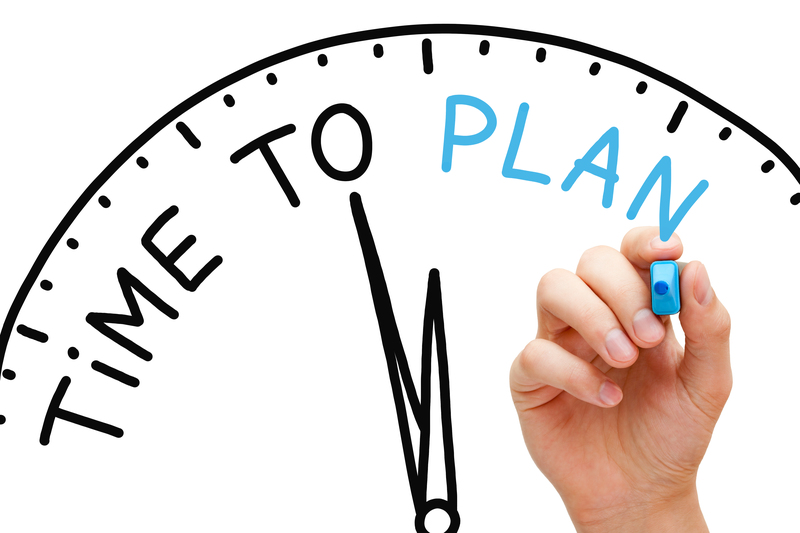 Such plans may depend on your industry and/or location, which is important to note for all temporary workers. Plans may include: fire, medical emergency, natural disaster, active shooter, chemical spillage or release, gas leak, etc. We’ve all done it. Call your friend to make plans, find the perfect radio station, take another sip of soda, or linger your gaze on that cool car in the next lane – all while driving. 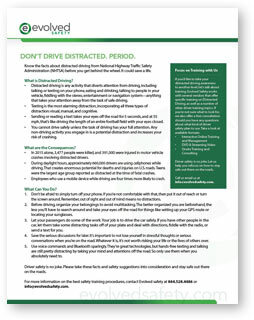 You may think it’s second nature, but it’s still considered distracted driving. And in looking at statistics from 2015, we are reminded yet again just how dangerous distractions while driving can be, claiming 3,477 lives and injuring more than 390,000, according to the National Highway Traffic Safety Administration (NHTSA). Though many states are enacting law to prevent mobile device use while at the wheel, such as banning texting or talking on the phone while driving, there’s much you can do to bring awareness to the issue both at home and in the workplace. Can anyone guess what the #1 type of distracted driving is out there on the roads? Yup, you probably guessed right – Texting. Sending or reading a text incorporates all three types of distraction. During daylight hours, approximately 660,000 drivers are using cellphones while driving, which creates enormous potential for deaths and injuries on U.S. roads. Employees who use a mobile device while driving are four times more likely to crash. So, what can you do to protect yourself and others while on the road? As an employer, it’s your responsibility to train your workforce of the dangers of distracted driving. So with you in mind, we put together an informational flyer that you can give to your workers and drivers alike. Please keep in mind, however, that this is *not* to be used in place of actual distracted driving training, only as a refresher and guideline. The event calendar for 2017 is heating up, and we want you to stay ahead of the game. This month, take a look at freshly added dates and events on our downloadable calendar to ensure you’ve got a complete rundown of all EH&S events happening in the country and around your area. We’ve even added another show to the growing list that we’ll be attending this year! So go ahead – download, print, and post to stay current on your safety dates. Check Safety Off the List this Holiday Season! December 12, 2016 / Comments Off on Check Safety Off the List this Holiday Season! The holidays are busy enough without having to take a trip to the Emergency room, so we’ve put together a checklist of the top 10 basic precautions you can take to be on the “nice” list when it comes to ensuring your whole family remains safe and injury-free throughout the season. You can download and print to share with your team or hang the list next to your stockings. Happy Holidays from all of us at Evolved Safety! Keeping track of need-to-know dates is a lot easier when you can see them every day. Which is why this month we thought it would be a good idea to offer a safety calendar for 2017, complete with notable dates and monthly observances to keep you ahead of the safety game this coming year. The best part – you can download and print it right from your computer to display where-ever you choose. The back to school ads are already running and you’re probably getting in those last chance vacations and BBQs before summer comes to a close. Not to make you sweat more than an August heat wave, but 2017 planning is right around the corner. Download our free EH&S Training Planning Guide and make it easy to get your training needs in order and your budget planned so you can enjoy the dog days of summer. Evolved Safety offers a fresh approach to sourcing your safety training from the industry’s top vendors. Acting as your buyer’s agent, we help ease the burden of finding and selecting your safety training while saving you time and money. Evolved Safety helps you implement your training program, support you through the lifetime of the program, and when it’s time to make a change they help you find the next resource and make the transition as seamless as possible. Let’s have a 15 minute phone call to see if we can save you time and money. What have you got to lose? Contact us at 844.528.4486 or visit www.evolvedsafety.com to learn more.